"Piece by Piece, Child by Child"
"Adam was the smallest boy in his 5th grade class. He got picked on and called names, like 'shrimp' and 'shorty', he had learned to ignore the taunts and walk away; but after he was molested by his stepfather and had to talk to the police, he was sure that everyone would know what had happened to him, the teasing for that would be unbearable. Adam had been hoping to start middle school with a growth spurt and new friends, he just wanted to fit in, but that didn’t seem possible now; and now that his stepfather had been arrested, there was no money for school supplies or a new backpack. Adam loved his old Spider Man backpack, but he knew that no one was else in middle school would carry one this year. It would be one more reason to tease him. He dreaded the start of school. But when and his Mom were invited to the Houston Area Women’s Center 'Back to School Project', Adam saw hundreds of backpacks laid out before him – every color, size and design you could hope for! For a moment, Adam felt like a normal kid. After much deliberation, he chose a black backpack with a Nike swoosh, no one would make fun of Nike. He was learning from his counselor that what happened to him was not his fault and that no one could tell by looking at him that he had been abused. He was learning about the court process and the importance of his testimony from his court advocate. And he was beginning to think that he might make some new friends at his new school. Plus, he grew two inches over the summer! Things were definitely looking up!" School is barely out and the summer has just officially started, but the Houston Area Women's Center (HAWC) is already preparing for the start of a new school year through their annual "Back to School Project", in which new backpacks and new school supplies are distributed to the 1,200 or so children served by HAWC. Piece by Piece, Child by Child. The children in HAWC's program have experienced sexual abuse, exploitation, domestic violence, or have been witness to such crimes, and it is the mission of the "Back to School Project" to equip them not only with new, much needed school supplies, but also with excitement, confidence, joy, and perhaps even a return to innocence. Planning for the "Project" is a continuous and lengthy process, as soon as the current year's "Project" ends, next year's "Project" begins. The planning committee consists of a very spirited group of HAWC staff members and volunteers, led by Pam Hobbs, manager of the Children's Court Services Program. Every year the "Project" is announced at a lunch attended by selected business and individuals, some of them new to HAWC's mission, and some of them veterans in their pledge to assist HAWC gather the supplies or the funds to purchase them. The pledge puzzle becomes larger. HAWC president and CEO "I remember my first day of school". Mary Moore's call to action. and Pam Hobbs, director of Children's Court Services recounted Sophie's story of sexual abuse and healing. Pam Hobbs recounts Sophie's story. 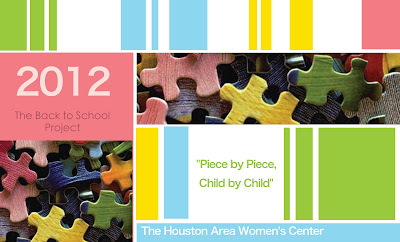 Many thanks to The Houston Area Women's Center for letting me be a part of this most worthy of causes. All images by Nadia Palacios Lauterbach. Top of the range, very interesting and informative post.